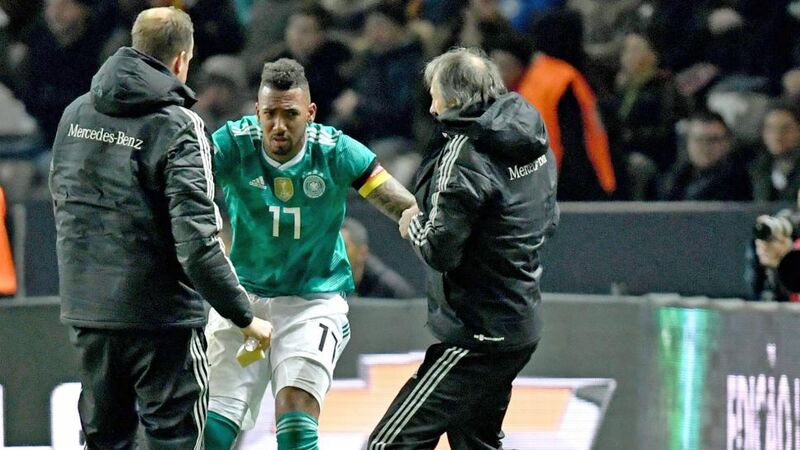 Germany coach Joachim Löw handed Jerome Boateng the captain's armband in his hometown of Berlin for the 1-0 friendly defeat to Brazil, but the Bayern Munich defender was brought off with a suspected ankle knock midway through the second half. While it was a proud evening for Boateng, who led his country in the absence of Juventus midfielder Sami Khedira, the skipper for Friday’s 1-1 draw against Spain in Düsseldorf, the 29-year-old had to be replaced by club-mate Niklas Süle in the 68th minute. The Berlin native had gone down holding his ankle in the 51st minute after a heavy challenge by Gabriel Jesus, the scorer of Brazil's goal at Hertha Berlin's Olympiastadion, before being treated on the sidelines. Boateng gamely carried on for 17 more minutes, but Löw was visibly concerned and checked in with the defender, who gestured towards his ankle, when he was withdrawn. Watch: See how Boateng made it to the top. Germany's defeat in the capital brought to an end a 22-game unbeaten run that stretched back to July 2016.